Whether you’re using your home bar for a weekend get-together with friends or to simply enjoy a quiet drink at the end of the day, we would always recommend a home bar. Commercial bars have an array of unique styles, everything from industrial to velour to masculine. We are noticing the trends making their way into residential designs on a much smaller scale. Our favourite materials are naturally sourced, such as granite, marble and copper. 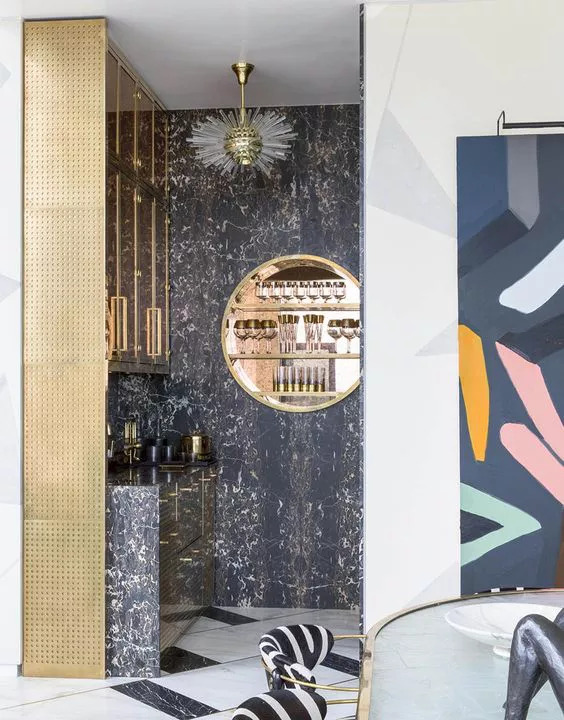 We love this example from Kelly Wearstler which beautifully combines metals and marble. The contrast between two such bold textures works fantastically, with the angled geometric shapes creates a very bold and dominating space. Incorporating a fridge to cool your drinks and mixers is a key element to the bar design. Depending on your colour and material palette, there are many options that you can integrate into your bar. A current trend is a copper or brushed metal finish with a dark reflected glass. 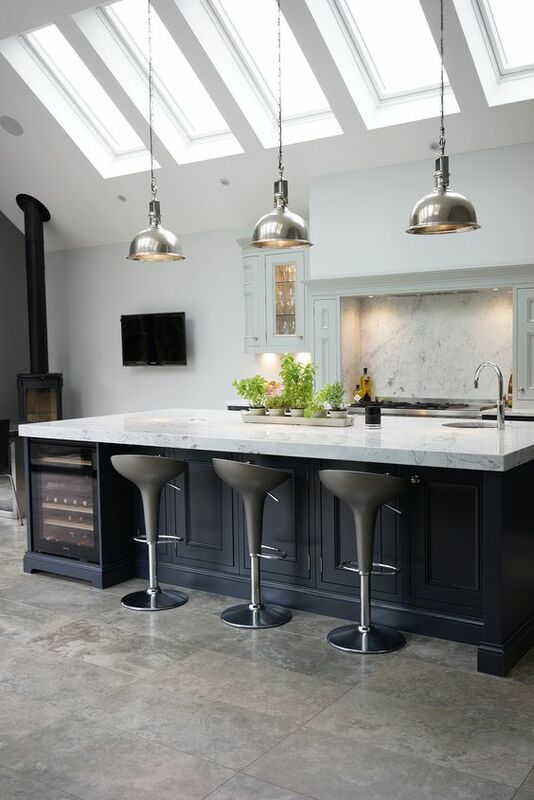 We love this subtle integration from C&C Kitchens below. 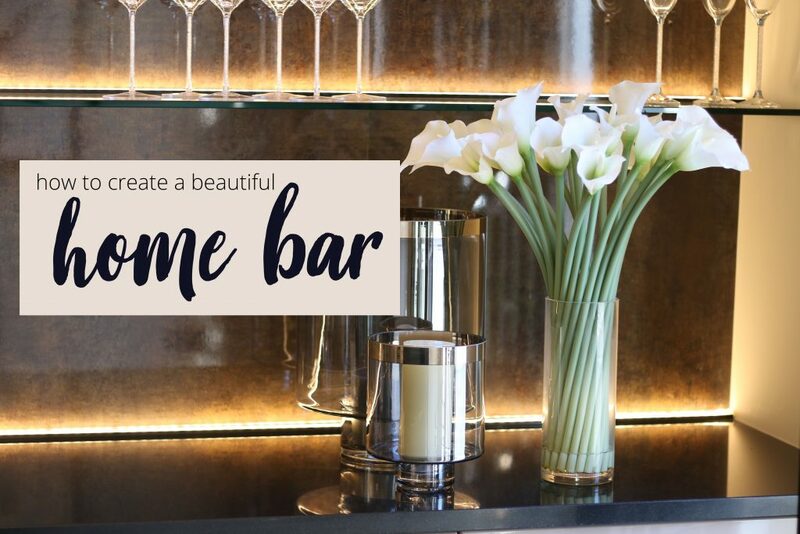 Top Tip: Fresh Home discuss how to add appliances to home bars. Whether your home bar is a separate room or not, creating a colour scheme for your bar is a great way to zone off the space. We have picked our favourite colour schemes from bold to muted tones to inspire you. First up is this impressive punch of colour from Boca Do Lobo which adds a playful yet sophisticated look. The jewel tone wall behind makes a beautiful backdrop to the bold pop of colours from the cabinet. Bar stools are a great way to add a softer feel, especially when using bold textures such as copper or marble. 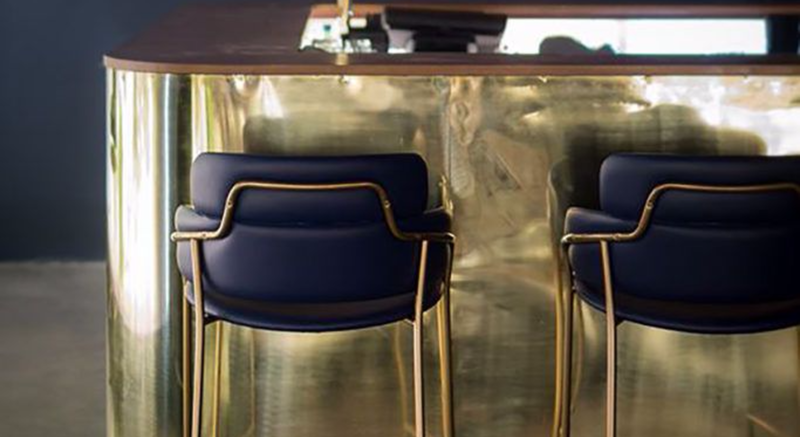 We love these jewel blue leather stools with the elegant gold legs. With elements of art-deco design, these work beautifully against the copper strip around the edging. In contrast heavy materials such as marble, using a fabric chair is a great tip to soften the appearance. Using velvet and plush fabrics in rich tones, such as jewel tones will give an elegant and timeless appearance. 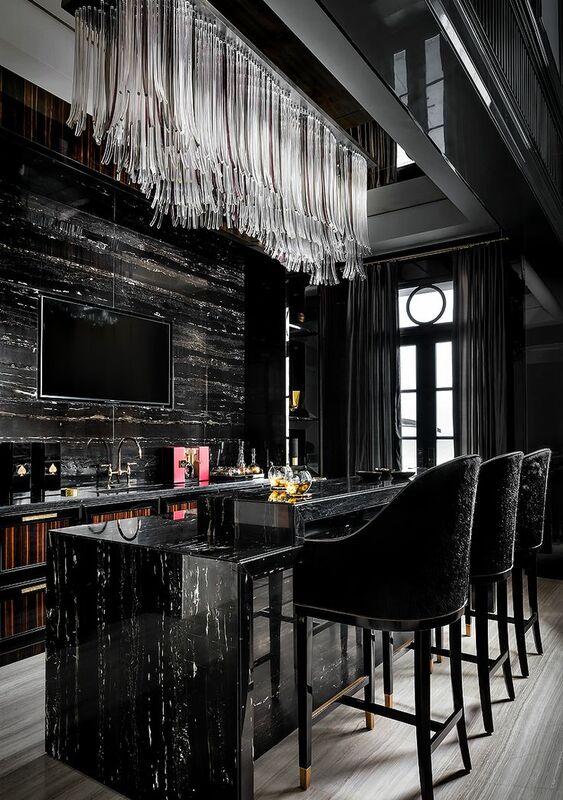 Our latest property Fairmont (view inside) had an integrated bar area which boasted an impressive display using a dark marble effect. We styled this with a stunning stainless steel & marble bar by Eichholtz. 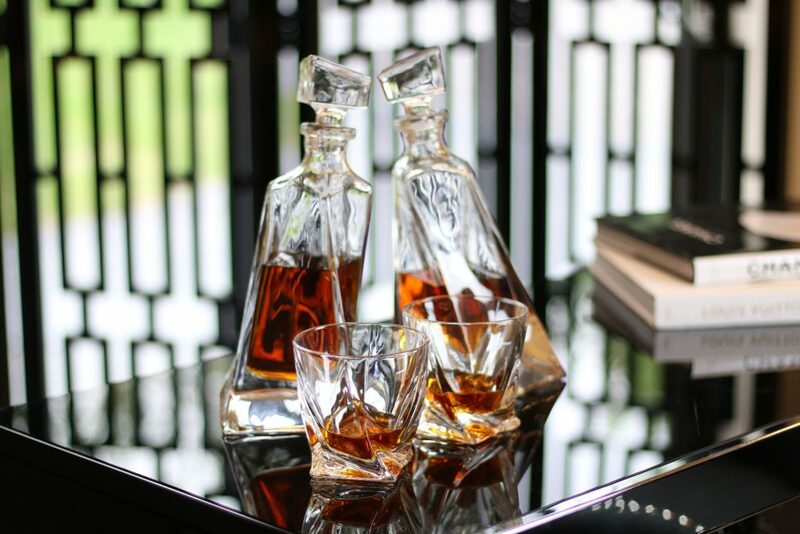 Depending on the style of your bar, you can decide whether you take a minimal approach or whether you want to display drinks, glasses and accessories. 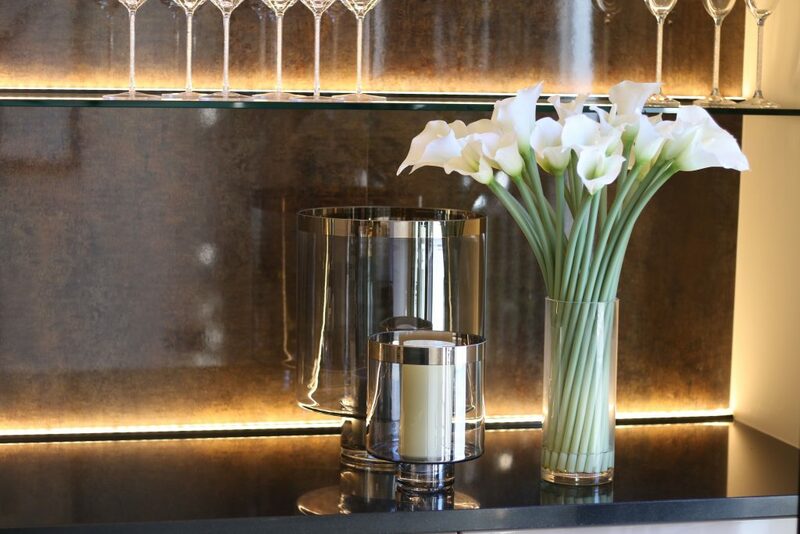 We styled ours with two books, an elegant vase of calla lilies and a trio of crystal whisky glasses & dispenser. To create a beautiful decorative element, we incorporated this folding screen by Eichholtz. With the beautiful rectangular patterns, the design has an art-deco feel.